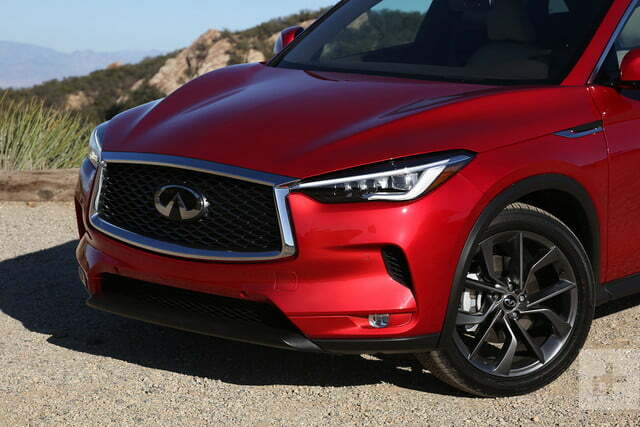 With the 2019 QX50, Infiniti is venturing deeper into the heart of the luxury market. When it comes to technology, the packaging can be as important as the gadgetry itself. Apple discovered this truth early on with its computing and smartphone products — it’s part of the reason why the company can now charge $1,000 for a phone. But consumer tech isn’t the only place for a clever container. The VC engine is a key differentiator within the premium compact SUV segment. For 20 years, Infiniti’s engineers developed a revolutionary engine technology that would tailor an internal combustion powertrain for efficiency or performance — on demand. Finally, the variable compression (VC) design was ready for production, but rather than slotting the motor into a current model, the luxury automaker chose to package it within its most important new product. 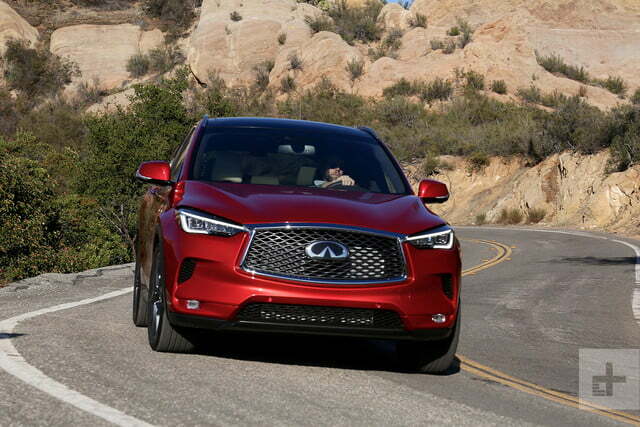 The 2019 Infiniti QX50 inherits the world’s first VC engine as a key differentiator within one of the most popular vehicle segments: premium compact SUVs. With rivals like the Acura RDX and Lexus NX, the all-new QX50 stands its ground with a bold exterior design, luscious interior, class-leading efficiency, and advanced safety features. Available in front-wheel drive or all-wheel drive configurations, the 2019 QX50 starts at $36,550. 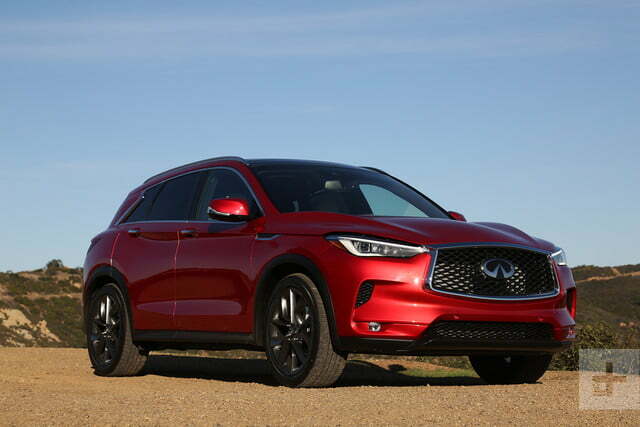 Read on for our 2019 Infiniti QX50 first drive review. Before diving into how the VC engine works, let’s touch on some of the new QX50’s other technologies. Driver assistance features are finding their place among the most important factors in new vehicle purchases – especially when it comes to luxury products. To satisfy safety-conscious consumers, Infiniti introduces its Pro Pilot Assist driver aids on the 2019 QX50. Designed to reduce fatigue and respond quickly to emergency situations, Pro Pilot Assist includes adaptive cruise control, braking assistance, and lane keeping measures. Utilizing Infiniti’s Direct Adaptive Steering system ($2,000), the QX50 is the first production vehicle to offer steer-by-wire technology for driver assistance. Electric motors and sensors mimic the responsiveness of rack-and-pinion systems, while filtering out road vibration that would otherwise disturb the driver. Though early versions of this system proved temperamental and oversensitive, the latest version is significantly more natural. Early versions of Direct Adaptive Steering were overly sensitive, but the latest version is significantly more natural. Other available driver aids include: distance control, back-up collision intervention, forward collision warning, blind spot warning and intervention, lane departure warning and intervention, forward collision warning with pedestrian detection, parking assist, a surround-view camera and a head-up display. The combination of these available features gives the QX50 an edge over the Lexus NX (which doesn’t offer adaptive cruise control or lane keeping assistance) and the RDX (which doesn’t offer blind spot monitoring, rear cross-traffic monitoring, or parking assistance). Interior technology is less of a slam dunk for the QX50. 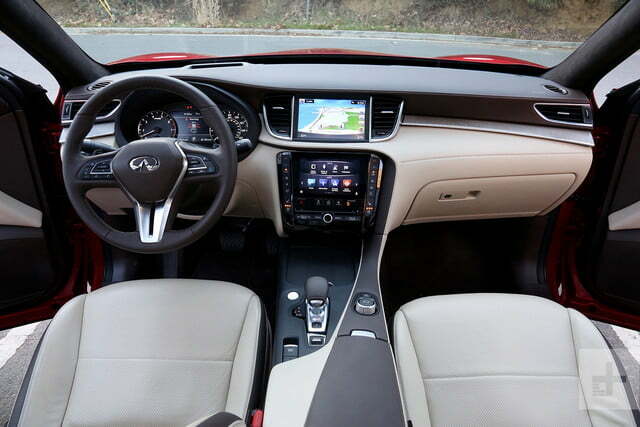 Rather than using the QX50 as an opportunity to part with its confusing two-monitor infotainment arrangement (introduced on the Q50 sedan), Infiniti soldiers on with its Intel-powered tech, which forgoes staples like Apple CarPlay and Android Auto. A top monitor displays a real-time map, while a bottom display, separated by a leather or plastic partition, is dedicated to destination controls, audio, and other app-based controls. Infiniti claims its owners prefer to keep the map displayed at all times (hence the need for a second screen), but the required real estate seems too great a cost. Worse, however, is the sluggish response and low resolution of both displays. The saving grace for this particular setup is a number of physical button redundancies, limiting required use of the bottom display. Shoppers eyeing the Lexus NX and Acura RDX won’t find greater sophistication in either SUV’s infotainment, but they will find more intuitive controls. Look beyond the monitors and you find a handsome, stylish cabin made from quality materials. Soft leather panels, real wood grain trim, and brushed metal accents feel more in line with full-luxury German marques than the QX50’s “entry-level” luxury rivals. 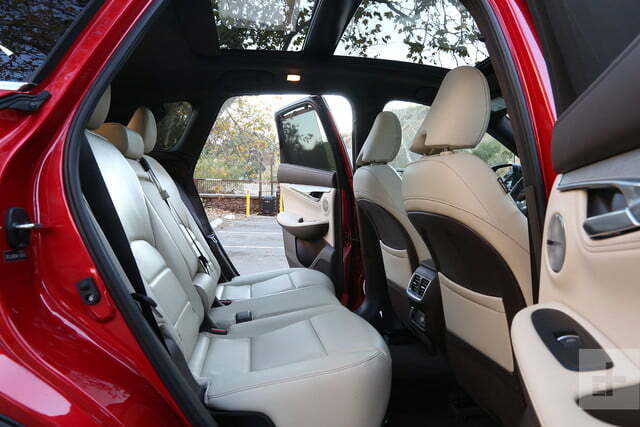 Chief among the SUV’s interior flourishes are its available Zero Gravity seats. Ergonomic, supportive, and immensely comfortable, we struggle to recall a more supple driver/passenger seat duo in any vehicle segment. Put it this way: if Infiniti sold these seats as home furniture, we’d buy a set for every room. While the outgoing QX50 struggled in terms of passenger and cargo volume, the redesigned model excels in these areas. Full size adults enjoy ample head and knee room on sliding, reclining, and folding rear bench seats. 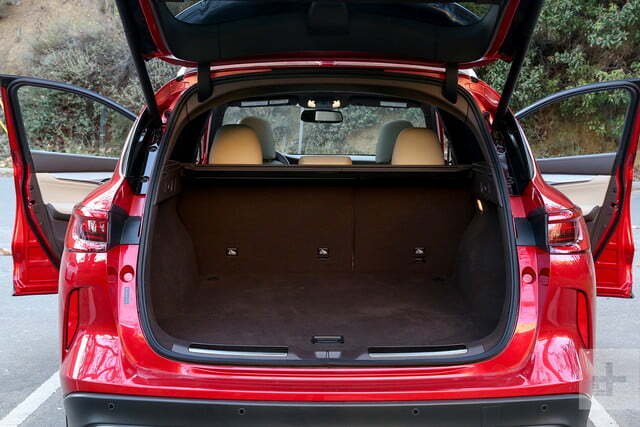 Meanwhile, the rear cargo area swallows a class-leading 31 cubic feet. 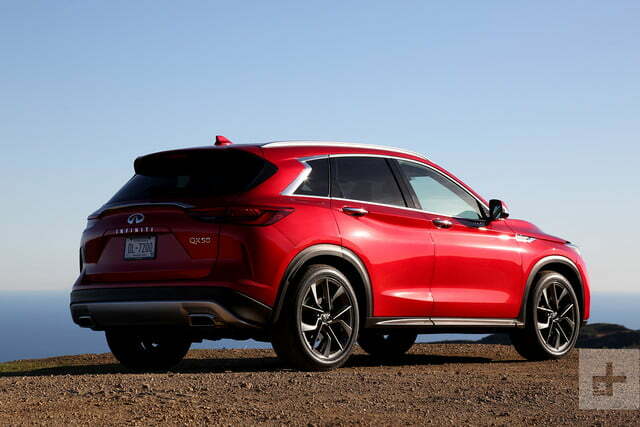 The 2019 Infiniti QX50 already has an edge over its competitors by other measures, but its innovative engine truly seals the deal. To intelligently and seamlessly switch between performance or efficiency-optimized behavior, the QX50’s variable compression engine changes its compression ratio via a multi-link system. By extending an arm within the compression chamber, the piston’s reach contracts to a 14:1 ratio for improved efficiency. When the arm retracts, the piston’s reach extends to an 8:1 ratio, enhancing performance. This full-spectrum shift occurs in less than a second. Driving behavior directly influences the multi-link’s behavior. Get aggressive with the throttle and the engine will fully retract the multi-link, but a normal mix of progressive throttle inputs will constantly vary the compression ratio. From the driver’s seat, most people will struggle to notice the VC Turbo at work – and that’s perhaps its most impressive quality. Far more apparent is the QX50’s quiet cabin and refined road manners. The 2.0-liter four-cylinder engine works in tandem with a single turbocharger to deliver 268 horsepower and 288 pound-feet of torque via a continuously variable transmission (CVT). Driving engagement takes a back seat to sophistication in the new QX50. While the 2019 QX50 loses 57 hp to its predecessor, it gains 21 lb-ft of torque and reaches peak power/torque earlier. For comparison, the 2019 QX50 is down 11 hp to the Acura RDX and up 33 hp on the Lexus NX. The combination of a hyper-efficient engine and transmission affords the front-wheel drive QX50 a segment-best combined mpg rating of 27. All-wheel drive equipped models still trounce the competition with 26 combined mpg ratings. The underpowered Lexus NX isn’t too far behind at 25 combined mpg, but Acura’s RDX trails considerably with its 23 combined mpg rating. As is common with entry-level premium vehicles, driving engagement takes a back seat to sophistication in the new QX50. 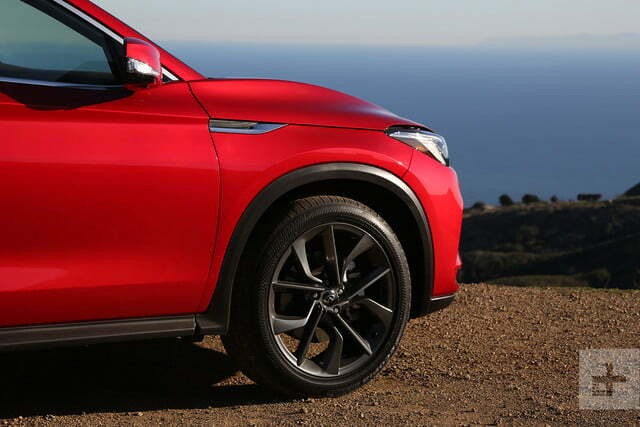 This is a distinct shift from Infiniti models of old, and will no doubt ruffle some feathers among certain enthusiasts, but it will also broaden the brand’s appeal to many more buyers. 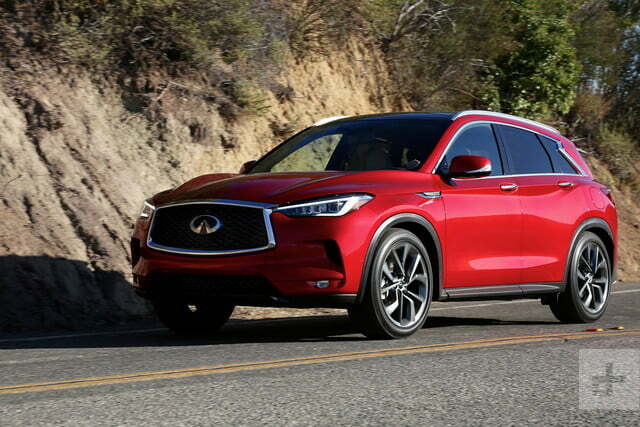 The 2019 Infiniti QX50 is sold with a 4-year/50,000-mile limited warranty and a 6-year/70,000-mile powertrain warranty. Infiniti’s reputation for reliability is largely positive, with few defects and minimal wear and tear over the product’s life. Resale values may not be as high as Acura or Lexus, but Infiniti vehicles certainly won’t plummet in value after the first few years. It’s common for luxury vehicles to start at somewhat attainable prices, while obscuring tens of thousands of dollars of optional (and desirable) extras. 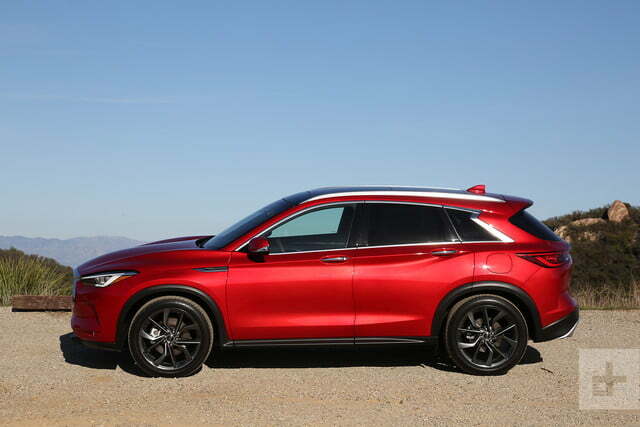 The 2019 Infiniti QX50 is not one of those cars. 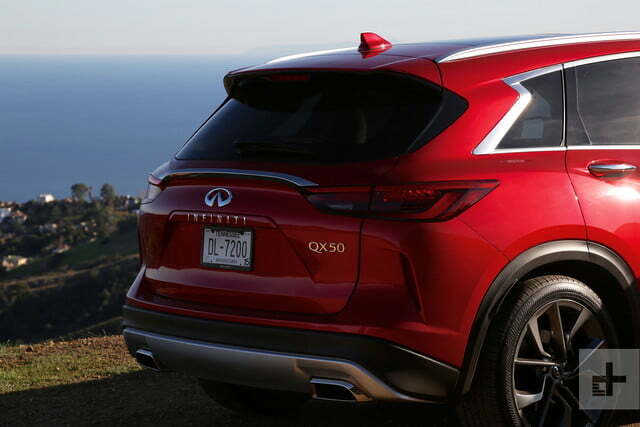 Our perfect QX50 is equipped with the Essential trim line and the optional all-wheel drive system. Outside, we prefer a Hermosa blue paint job, and inside, the wheat leather with maple wood trim strikes our fancy. Upon this foundation, we’d add the Premium Heat Package ($1,200: heated front seats and steering wheel, memory seats, mirrors and wheel, and power tilt/telescoping wheel), ProAssist Package ($500: intelligent cruise control, distance assist, rear cross traffic alerts, backup collision intervention), and ProActive Package ($2,000: direct adaptive steering, steering assist, full-speed adaptive cruise control, blind spot intervention, lane departure warning and intervention, high beam assist, easy park assist, and a head-up display). Final score: $48,900. With the introduction of the 2019 QX50, Infiniti is venturing deeper into the heart of the mainstay luxury market than ever before. Innovative engine and driver assistance technologies, an inspiring design, sumptuous cabin materials, and refined driving dynamics put the QX50 in the crosshairs of BMW, Audi, and Mercedes-Benz. Lesser lux players have some serious catching up to do.